More than 50 protesters gathered at Bancroft Way and Telegraph Avenue Wednesday afternoon before marching to the Tang Center to protest changes to UC Student Health Insurance Plan coverage. The protesters requested that UC administrators meet numerous conditions, including no increases in SHIP fees, lifting coverage and prescription drug caps on SHIP plans, improvements in dependent care and a new contract that prevents layoffs for health care workers. “We’re protesting the fact that UC SHIP is exploiting a loophole in Obamacare that makes it so we still have caps on our services,” said Austin Pritzkat, a UC Berkeley sophomore and organizer for CalSERVE. The protesters came from a variety of student groups and unions, including CalSERVE; UAW Local 2865, which represents student-workers; and AFSCME 3299, which represents health care and service workers. In response to their efforts, Chancellor Robert Birgeneau agreed to meet with a group of students sometime during the next two weeks to discuss the conditions involved in the protest, said campus spokesperson Janet Gilmore in an email. 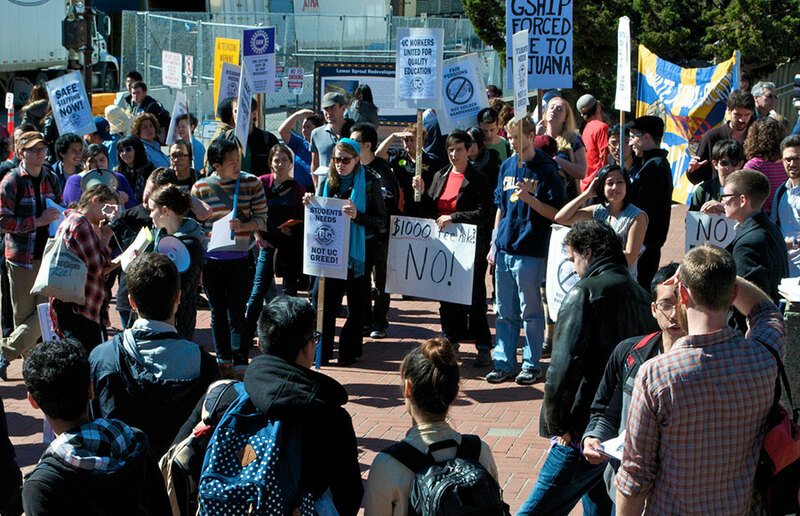 The protest comes less than three weeks after it was revealed that UC SHIP is projected to have a systemwide $57 million deficit and that administrators have recommended increasing premiums by an average of 25 percent systemwide, including a 19.8 percent increase for UC Berkeley students. Following their march down Bancroft, the protesters reached the Tang Center, where eight went inside for a sit-in in the lobby while about 50 others continued their protest in the courtyard. The sit-in at the Tang Center continued for more than two hours as the protesters spoke with Ron Coley, associate vice chancellor of business and administrative services, and Dean of Students Jonathan Poullard. The students left the Tang Center after the chancellor agreed to meet with them. “They were very open to working with us, and they were very clear that their interests are very well-aligned with ours,” said UC Berkeley student Maggie Hardy. Gilmore said the Tang Center was able to remain open to patients throughout the day. “We are sympathetic to the students’ position and understand that they were seeking to bring attention to their cause,” Gilmore said in an email.